A pit bull panting. 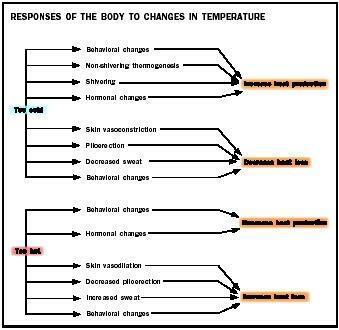 Thermoregulation is the balance between heat production mechanisms and heat loss mechanisms that occur to maintain a constant body temperature. heat production mechanisms and heat loss mechanisms that occur to maintain a constant body temperature. Heat flows from higher temperature to lower temperature. Conduction is the transfer of heat between objects that are in direct contact with each other. For instance, if a person sits on the cold ground, heat moves from the body to the cold ground. Convection is the transfer of heat by the movement of air or liquid moving past the body. This explains why a breeze across the skin may cool one down, whereas trapping air inside clothing keeps the body warm. A lizard sunning itself on a rock on a warm summer day illustrates radiation: the transfer of heat energy via electromagnetic waves. Whereas conduction, convection, and radiation can cause both heat loss and heat gain to the body, evaporation is a mechanism of heat loss only, in which a liquid is converted to a gas. Perspiration evaporating off the skin is an example of this heat loss mechanism. When the body is too hot, it decreases heat production and increases heat loss. One way of increasing heat loss is through peripheral vasodilation, the dilation of blood vessels in the skin. When these vessels dilate, large quantities of warmed blood from the core of the body are carried to the skin, where heat loss may occur via radiation, convection, and conduction. Evaporation of fluids from the body also causes heat loss. Humans constantly lose fluids from the skin and in exhaled air. The unconscious loss of fluid is called insensible perspiration. Although the body has no active control over insensible perspiration, the sympathetic nervous system controls the process of sweating and can stimulate secretion up to 4 liters (4.22 liquid quarts) of sweat per hour. In order for the sweat to evaporate and cool the body, the environmental air must have a relatively low humidity. muscles, produces heat. Heat can also be produced by nonshivering thermogenesis, an increase in metabolic heat production. Hormones such as epinephrine, norepinephrine, and thyroid hormone increase the metabolic rate by stimulating the breakdown of fat. Humans also change posture, activity, clothing, or shelter to adjust for fluctuations in temperature. The goose bumps that arise on the skin in the cold are another sign the body is trying to prevent heat loss. They are due to piloerection, the erection of the hair follicles on the skin. This is a vestige of the time when humans were covered in hair: piloerection would trap air and retain heat. Body temperature is regulated by a system of sensors and controllers across the body. The brain receives signals regarding body temperature from the nerves in the skin and the blood. These signals go to the hypothalamus, which coordinates thermoregulation in the body. Signals from the hypothalamus control the sympathetic nervous system, which affects vasoconstriction, metabolism , shivering, sweating, and hormonal controls over temperature. In general, the posterior hypothalamus controls responses to cold, and the anterior hypothalamus controls responses to heat. Hypothermia, or low body temperature, is a result of prolonged exposure to cold. With a decrease in body temperature, all metabolic processes begin to slow. Hypothermia can be life-threatening. Hyperthermia describes a body temperature that is higher than normal. One example of hyperthermia is fever. A fever is generally considered to be a body temperature over 38 degrees Celsius (100.4 degrees Fahrenheit). A fever is the body's natural defense to an infection by a bacterium or virus. Fevers are one of the body's mechanisms for eliminating an invading organism. Fevers may even make the immune system work more effectively. Heat exhaustion and heatstroke are other examples of hyperthermia. These occur when heat production exceeds the evaporative capabilities of the environment. 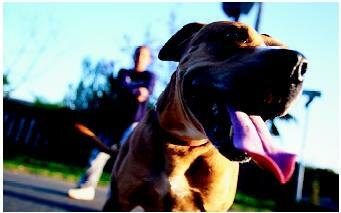 Heatstroke may be fatal if untreated. Marieb, Elaine. "Nutrition, Metabolism, and Body Temperature Regulation." In Human Anatomy and Physiology, 5th ed. New York: Benjamin Cummings, 2001. Sherwood, Laurelee. "Energy Balance and Temperature Regulation." In Fundamentals of Physiology: A Human Perspective, 2nd ed. New York: West Publishing Company, 1995.